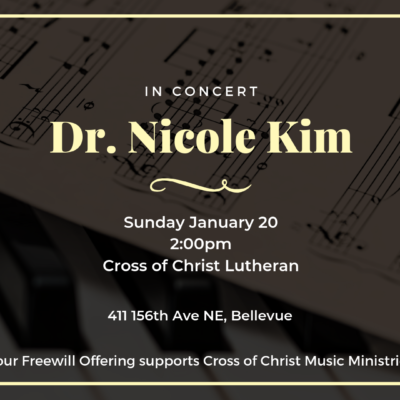 On Sunday, January 20 at 2pm, Cross of Christ is fortunate to host regular attendee, noted pianist, teacher, and local music community leader Dr. Nicole Kim in concert. 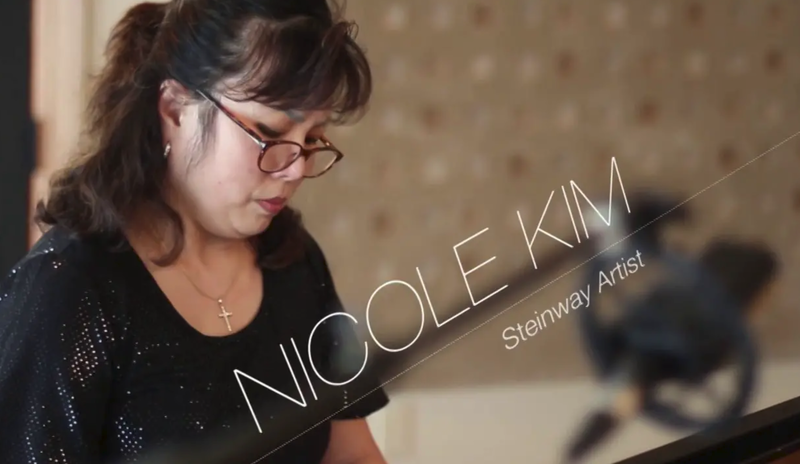 Dr. Kim is a Steinway Artist, one of very few pianists recognized by Steinway with such distinction. The concert is free and open to the public; a freewill offering benefitting Cross of Christ Music Ministries will be taken at the door. Dr. Kim began her musical study at age four in her native country, South Korea. With the encouragement of her maternal grandfather, who played multiple instruments including violin, mandolin, and Korean Flute, she learned to sing German Lied from him at age five. She had her orchestral debut at age eleven performing Mozart Concerto K488, which was broadcasted on radio and highly acclaimed. She received her bachelor’s degree from Seoul National University. After moving to the States, she studied with Robert Turner, Daniel Pollack, Eduardo Delgado, and Mac McCray. Especially with Mr. Turner, as well as Mr. Pollack who was a student of Mr. and Madam Levine, she learned keen observation with fluent technique. In addition Mr. Delgado taught her lyricism, and Mr. McCray taught her the joy of piano. Later she studied impressionism with renowned Fulbright Scholar of French music, Ms. Bricard. Her harpsichord teacher was none other than the great, Canadian born, late Mr. Malcolm Hamilton. Dr. Kim’s Master’s degree is from the San Francisco Conservatory of Music with Mr. Mac McCray, the winner of Liszt International Piano Competition, and her doctorate is from the University of Southern California with Mr. Daniel Pollack, the winner of the International Tchaikovsky Competition. As a winner of multiple competitions, such as the Joanna Hodges International Piano competition, she has been concertizing in the states as well as abroad. While being a faculty member of Cerritos College in Norwalk, California, she was actively involved in numerous performances and quoted as one of the best musicians in southern California by an Orange County newspaper. Her performance with the Cypress City orchestra on the City Hall Green was featured on media. In 1998 she was invited to perform at the City Hall Auditorium as an artist of the year for the city of Bellflower. In 1999 she accepted a faculty position at Soowon University in S. Korea to teach music for undergraduate students. She has been an affiliated faculty at Bellevue College and served as a board member for The Federal Way Symphony and National Music Teachers Association (MTNA), Eastside chapter. In addition, she served as a president for MTNA Lake Washington chapter. Dr. Kim has a deep understanding of different styles of compositions and has been a faithful interpreter of those styles. Her interest in various kinds of music led her to appreciate and perform extensive repertoires. She has been an educator and adjudicator both in the U.S. and abroad. Her performances in the Pacific Northwest were televised in Seattle and New York and broadcast on King FM Radio In 2012 she embarked the lecture of the Beethoven Piano sonatas, as part of completion of performing entire 32 piano sonatas of Beethoven. She has been featured in Who’s Who in American Women since year 2002. She is also a performing member of the Ladies Musical Club. She is a “Steinway Artist”.